Fill out the form below to purchase your tickets. You'll get a receipt via email which serves as your ticket. Please have a copy with you to show at the check-in line, this can be a digital copy or print out, along with your photo ID for verification. Thank you and have an awesome and safe experience! Additional sliders to be included in ticket purchase must also agree to the liability waiver. Please register additional sliders by selecting the register slider link on the homepage and completing the form. Checkout total will include tax. partial or total paralysis resulting from falls or contact with other patrons or the ground,and other ailments, conditions and personal injuries including death which may arise from the use of a water slide or the use by other patrons of the water slide. I further state that I (or the minor) have been advised NOT TO STAND UP WHILE SLIDING OR OTHERWISE ON THE SLIDE. I fully understand and acknowledge that these risks and dangers may be caused by the negligence of the owners, employees, officers or agents of UB Productions the negligence of the participants, the negligence of others, or by accidents, breaches of contract, the forces of nature, or other causes. PHYSICAL CONDITION. 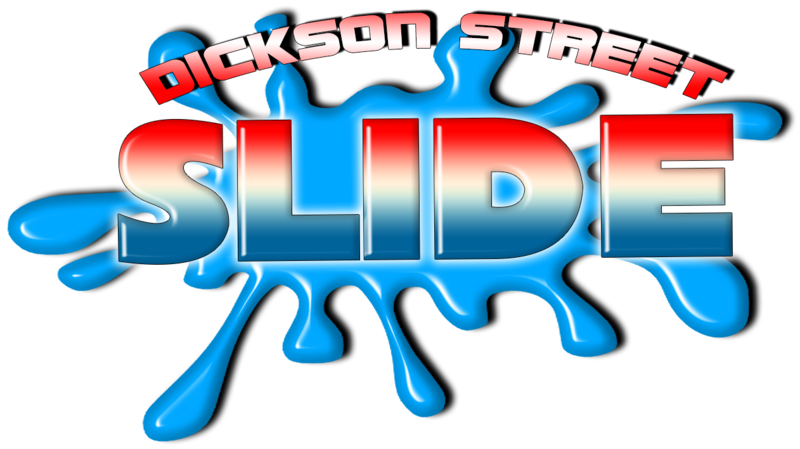 I state that I (or the minor) am physically fit for participation in the Dickson Street Slide, and have not been advised otherwise, and that I have not or will not at the time of participating be under the influence of alcohol or drugs which may impair my condition. UNSAFE CONDITION. I will immediately advise employees or agents of UB Productions of any unsafe condition that I observe, and will refuse to participate in the Dickson Street Slide until all unsafe conditions observed by me have been remedied. USE OF LIKENESS AND IMAGE. I irrevocably and unconditionally grant to UB Productions, and its respective licensees, successors, agents and assigns the non-exclusive right to take and create the photograph(s) and/or video(s) of me (collectively, the “Photographs”) while engaged in, observing or otherwise utilizing the Dickson Street Slide, and to use and exploit: (a) the Photographs, and (b) my likeness, voice and appearance incorporated in the Photographs as well as my name, biographical information and any statements (collectively, the “Personal Rights”) in, or in connection with, the Photographs, in any manner and in all media as UB Productions may desire, whether now known or later created, throughout the universe in perpetuity (including, without limitation, in commercials, in print media or publications, on the internet, on television, in merchandise, on radio systems, in DVDs, in social media, in online webcasts and Podcasts, and all supplemental market uses), and in all forms, whether for promotional, publicity, entertainment or advertising purposes or for any other purpose whatsoever, without further compensation or any limitation whatsoever. I understand and agree that UB Productions is not required or obligated to exercise any of its rights granted in this Agreement or provide me with any rights of approval, credit or billing at any time. I agree that UB Productions may sell, license or assign any of the rights, interests or obligations under this Agreement in whole or in part without my consent and without any additional payments of any kind. I agree that the Photographs may be edited, modified, added to, arranged, reproduced, juxtaposed, and otherwise revised for any reason and in any manner which UB Productions, may determine in its sole discretion. RELEASE AND COVENANT NOT TO SUE. I hereby RELEASE, WAIVE, DISCHARGE AND COVENANT NOT TO SUE OR MAKE A CLAIM against UB Productions from all liability to me, my personal representatives, assigns, heirs, and next of kin for any and all loss or damage, and any claim or demands therefor on account of injury to the person or property or resulting in death of the undersigned, whether caused by the negligence of UB Production or otherwise while the undersigned. INDEMNIFICATION. I hereby agree to INDEMNIFY AND SAVE AND HOLD HARMLESS the UB Productions and each of them from any loss, liability, damage, or cost they may incur due to my presence at the Dickson Street Slide or related events or activities and whether caused by the negligence of the UB Productions or otherwise. EXPANSIVE DEFINITION. I further expressly agree that the foregoing release, waiver, and indemnity agreement is intended to be as broad and inclusive as is permitted by the laws of the State of Arkansas and that if any portion thereof is held invalid, it is agreed that the balance shall, notwithstanding, continue in full legal force and effect. MINORS. I state and affirm that I am legally authorized to execute this Agreement on behalf of the below-identified minor, and may bind this minor to the terms of this Agreement. GOVERNING LAW/VENUE. I consent and affirm that this Agreement shall be governed by the laws of the State of Arkansas and that any lawsuit arising from this Agreement or the Dickson Street Slide shall be filed in Washington County, Arkansas. I AGREE THAT I HAVE READ AND VOLUNTARILY SIGN THE RELEASE AND WAIVER OF LIABILITY AND INDEMNITY AGREEMENT, and further agree that no oral representations, statements or inducements apart from the foregoing written agreement have been made.